Aramis has a tainted, unbreatheable atmosphere and little available surface water. The system has a population between 10,000 and 10 million, lacking the industrial base to be completely self-supporting. The world serves as the capital for the subsector. It is a member of Third Imperium in the Aramis Subsector of Spinward Marches Sector and in the Domain of Deneb. Aramis, as a member world of the Third Imperium, holds the estate of an Imperial knight, a member of the Imperial Nobility charged with overseeing the world. This world has a nearby Imperial Naval Base, capable of handling warships and an Imperial Scout Base, capable of handling Scout Service starships and personnel. Aramis has a tainted, unbreatheable atmosphere and little available surface water. The system has a population between 10,000 and 10 million, lacking the industrial base to be completely self-supporting. The world serves as the capital for the subsector. It is a member of Regency of Deneb in the Aramis Subsector of Spinward Marches Sector. This world has a nearby Regency Naval Base, capable of handling warships and a Regency Scout Base, capable of handling Scout Service starships and personnel. It is located in the Aramis Trace, and is the world that gives the grouping its name. Diameter: 5,904 miles (9,400 km). Government: Technocracy (headed by the marquis of Aramis). Most of the world population lives in the tunnel city of Leedor, which is the personal fief of the Marquis of Aramis. 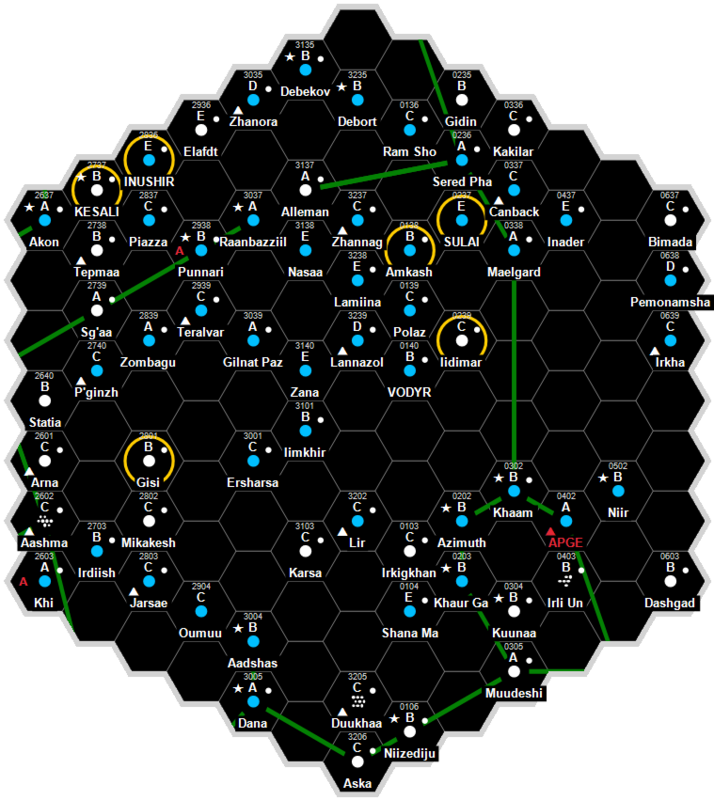 Tukera Lines, Akerut, Naasirka, and Imperiallines each have major offices at this starport. Aramis, as a member world of the Third Imperium has a member of the Imperial Nobility overseeing the world. Aramis holds the estate of the Marquis of Aramis, head of the planetary government of Aramis, owing fealty to the Count Knowln of Celepina. Frank Chadwick, John Harshman, J. Andrew Keith, Marc Miller, Loren Wiseman. The Traveller Adventure (Game Designers Workshop, 1983), 31-42. This page was last modified on 19 June 2018, at 07:39.